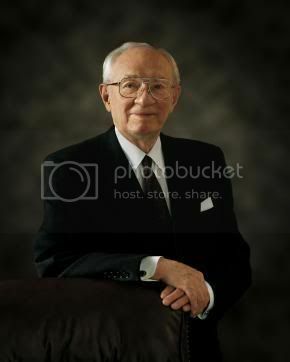 President Hinckley died last night. He was 97 years old, and President of the Church since March 1995. He was President around the time I started being active in Church again, so he’s pretty much the only President I’ve known. He came out to dedicate the Perth Temple and it was a treat to be near him. I always liked the way he spoke. And it’s amazing that he was lucid and aware being as old as he was but that’s testament to his being strengthened by God to do His work. I often wonder what it would have been like to know him personally. I imagine he is pretty happy where he is right now, reunited with his wife. Today is my birthday. Nothing too exciting, really. We went for dinner last night with my sister. As usual most of the time was spent entertaining the kids. I helped Jim Martin with his boat this morning. Cool project, but if I lived in a neighborhood like his I wouldn’t let my home get so junky. The guys on potf2.com wished me happy birthday which was nice.